A group of MBA students from the C. T. Bauer College of Business at the University of Houston took a trip to Austin to get a firsthand look at three Fortune 500 companies. The trip was organized by the college’s Rockwell Career Center, a dedicated career service center for Bauer students. Full-time MBA students from the C. T. Bauer College of Business got a firsthand look at three Fortune 500 companies earlier this month. 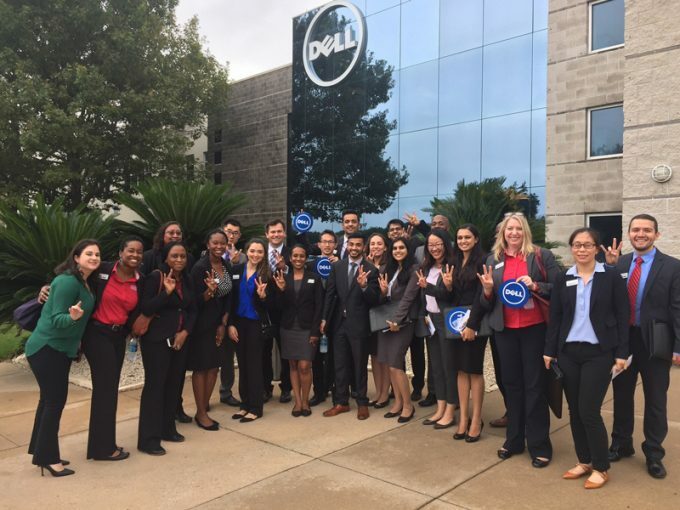 As part of a day trip to Austin organized by the college’s Rockwell Career Center, 19 MBA students toured the corporate offices of Whole Foods, Dell and General Motors, meeting with senior leaders at each organization. Prior to the trip, students were required to attend mandatory preparation sessions where they divided into teams and gave presentations on one of the companies to the rest of the group. Once the group arrived in Austin, they headed to the flagship Whole Foods store, where they received a tour from the store marketing manager and a lead team member. The students then visited the Whole Foods corporate office, where they met with Andres Traslavina, director of Human Resources, who shared more about the company’s recruiting process before heading to Dell. The trip finished with a visit to the General Motors IT Innovation Center, where students got an inside look at new strategies within the organization and networked with company leaders. Though the trip was the first of its kind offered to full-time MBA students, the college plans to offer the opportunity again next year, potentially expanding to include site visits to companies outside of Texas and representing different industries, Reed said. “It’s really difficult to see companies that are outside of the Houston area on your own — these students had the chance to see three in one day,” she added.